Air Raid Drill - 1940, London, England. These London schoolboys were photographed practising their actions should they inadvertently be caught by the Luftwaffe away from an air raid shelter. 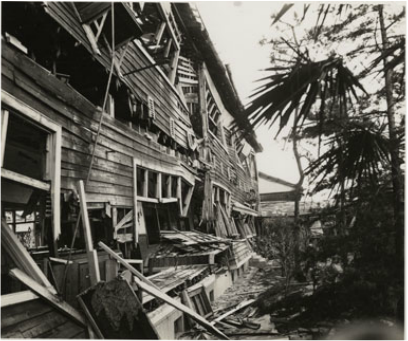 They were instructed to "Duck & Cover" for various reasons; to protect against flying glass, spalled plaster or lights falling from the ceilings, flying pieces of wood and bricks, and falling masonry. This approach is not controversial in the least; no-one claims this is bad advice in protecting oneself from conventional bombing. Mmmm …..that's kind of a logical line of reasoning, right? Almost all modern deployed ICBM nuclear warheads are in the 120-450 kt range; only Chinese warheads are routinely in the megaton range. The significant threat is from rogue states and terrorist organisations, not so much from sophisticated nation states. An improvised terrorist device is likely to be less than 60kt. Target cities (for both rogue states and terrorists) would generally be cities of significance and therefore very large (eg London, New York, etc etc). Almost no modern city centers are capable of giving rise to a firestorm. Most modern city centers have large numbers of reinforced concrete buildings (which are surprisingly resistant to blast). The implications for the above points are that there is almost certain to be a very large number of people in each major city who are not killed outright by a nuclear detonation. It follows that the needs of these people should be actively addressed by all means available. Here is a satellite image of London, the capital city of Britain, home to some 7.2 million people. And here is a simulation of a nuclear detonation in the centre of London, showing the nuclear fireball. This particular fireball is exactly the size of a 45kt explosion. Do you really expect that everyone in London would die from this explosion?! If not, then do you believe that civil defense preparations should be made to limit the final death toll? 2. There is a second aspect to the whole "Duck & Cover" matter. And that is the role of …...…..time. The concept of "Duck & Cover" was primarily aimed at getting people to respond quickly enough during the initial flash to cover their skin from the intense light and so avoid burns. Although the ideal clothing is thick and white and separated from the underlying skin by a few millimetres of air, ANY clothing will reduce flash burns to the underlying skin to a very significant degree. This will probably seem very surprising to you, but it is true nevertheless. For example, Japanese soldiers were wearing caps whilst exercising on the Parade Ground in Hiroshima when they were nuked (the parade ground was a short distance from ground zero). The skin on their their bare chests and faces was essentially destroyed - but because they had their caps on, their hair was protected. Witnesses saw these horrifically injured soldiers shortly after the detonation and were unable to distinguish noses, lips etc - but bizarrely they still had their healthy mops of hair on top. Nuclear detonations have varying lengths of thermal pulse depending upon the yield. If the thermal pulse is, say, 4 seconds then by rapidly covering up exposed skin within 1 second using "Duck & Cover" an individual could easily reduce the radiant thermal energy exposure by 75%. Even more important than the prevention of flash burns, is a person's preparation for the blastwave. Nuclear blastwaves quickly slow down to the speed of sound, and then propagate at this speed over the remainder of the city. Now, the speed of light is dramatically faster than the speed of sound, obviously. This relative difference in speeds is of very great practical importance. It means that the atomic flash gives a "heads up" to everyone that a powerful blastwave is coming. Many, many people in a capital city will have vital seconds to prepare themselves for its arrival. Let's get back to the schoolchildren scenario that started this page. 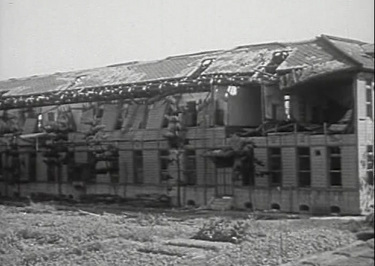 Here we see Hiroshima College - after the city had been atom-bombed. Do you think the schoolchildren attending that day should have ducked and covered just like those in London, or simply shrugged in resignation? Here is an inside view of one of the classrooms in a Nagasaki school. died from flash burns, flying glass, flying window frames (and doors and doorframes), or crushed by falling roof trusses and tiles. Would you say the students in this classroom in Nagasaki should not have bothered to "Duck & Cover?" Here is a different school building - This time it's Fukuromachi Elementary School, Hiroshima, 460 metres from ground zero. Date of photo Oct 1945. Would you say the children in this school should also not have bothered to "Duck and Cover?" Here is the North Wall, Wing No. 1, Funairi Grammar School, Hiroshima. Should they have used "Duck & Cover?" Perhaps they shouldn't have bothered?! Who, in their right mind (and with pure motives) can criticize and deride advice to "Duck and Cover"?! To do so is profoundly immoral.